We will be posting three blogs in the coming days representing different perspectives of Endangered Species Coalition staff that work on wolf recovery and protections. A couple weeks ago, I was in Phoenix talking to a friend. She said, “Women and wolves…” And paused for a moment, gathering her thoughts. “We’re like this,” as she raised her hand with her index and middle fingers crossed. What she was describing didn’t have any other words attached, but I immediately understood and the weight of those words sunk deeply in my heart. I grew up in a place where women are treated as pretty, little things by those who still hold onto the residual mindset of the Revolutionary War era. I can’t tell you how many times I’ve been told, “put your legs together,” “sit down,” “be quiet,” “be nice.” “Be nice.” That was the worst one. Where I’m from “being nice” means to not fight back. It means to put your head down when you hear or see injustice, because it would be rude to correct someone. Being nice did not end enslavement. It didn’t get white women, and later women of color, the right to vote. It didn’t start the civil rights movement and it didn’t get us a slew of environmental laws in the 1970s, including our old-faithful, the Endangered Species Act. When women are not “nice,” we are quietly, yet persistently, shamed and pushed to the outer rims of society or worse. We have been so tamed, that still in 2017, men and women do not share equal rights. We have been tricked into domestication over and over again. Like the “not-nice” women, the “not-nice” dogs of the wild have been put in their place, shown who’s boss, and pushed to the farthest corners of suitable habitat. 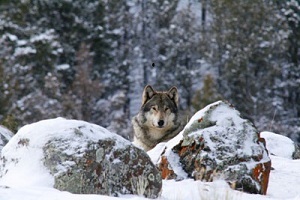 In the name of human encroachment, wolves have been shot, trapped, poisoned, and blown up with explosives. And, like our female ancestors, wolves and wildlife are treated like property by our state and federal agencies. 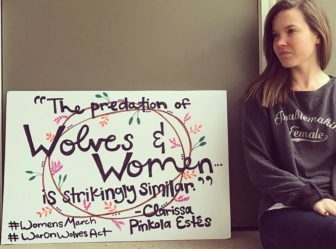 I see it as no coincidence that as many of our elected officials are plotting to take away women’s rights, they are also trying to pass legislation to delist wolves from the Endangered Species Act in the Great Lakes Region. The same people that devalue women also devalue wolves and the natural world. Wolves are not able to march for themselves, as many people around the world did last weekend. So, if there was ever a time to stand up for both, women and wolves, it’s now. Bills to delist wolves in Wyoming, Minnesota, Michigan, and Wisconsin have been introduced in the Senate and House of Representatives. These bills could move rapidly, making your email or call crucially needed. Please contact your senators and representative today and ask that they oppose the War on Wolves Act. Not only wolves but mother bears coyotes foxes are all in danger! Having ESA listing has not protected them from gruesome murderers, but without that label All Are in critical danger from imminent destruction … Along with the last wildlands which is their home. Getting wildlife the same Rights we humans enjoy (or did until this election)! Is the only way forward! i ESPECIALLY, like the green box that says DONATE. You people need to get a real job, instead of living off of donations from gullible people who care more from wild animals than they do people. I’m from Wyoming and wolves are causing real hardship to real people. With the endangered species act , we now have a federal government that is so arrogant that it can take away the God given right of the shepherd to protect his defenseless lambs. I’m not anti wolf, I’m pro people. We never wanted the wolf reintroduced to begin with, and you didn’t do the wolf any favors by reintroducing them because a lot of wolves are going to die. Like I said ,get a job. Stand up, speak out. Wolves and all our precious wildlife are in grave danger under trump. We cannot be disengaged, the future of the Wild depends on us.